Cat poo stinks. We all know it. Those of us who have cats, though frequently amazed at the sheer magnitude of stench our cuddly friends are capable of, do little to remedy the situation. Sure, sometimes we buy the fancier kitty litter or the special food. [agraham999] decided to be a little more proactive. 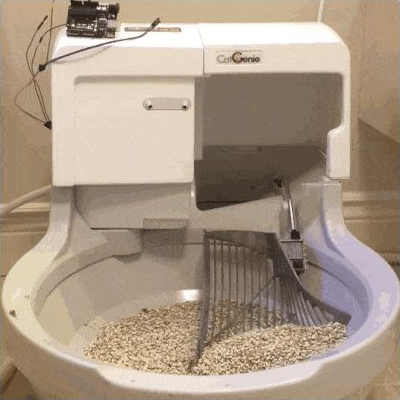 He built an automated exhaust system for the litter box. He wasn’t content to just rig a fan blowing to an exhaust vent either, he hooked it up to an automation system and a motion detector. The total cost for the project was $80, not including the mac mini that serves as the brains. Be sure to read through the comments for some very in depth discussion about power usage and solar conversions.